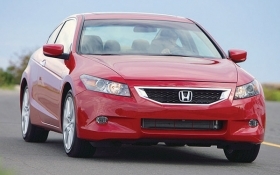 A truck drought and a Honda clearance incentive helped the top-selling Accord, shown, beat the perennial No. 1 Ford F-series pickup by 455 units last month. Last month, U.S. new-vehicle buyers preferred the Honda Accord sedan to the Ford F-series pickup. The F series isn't often outsold, even for a month. It has been America's best-selling vehicle every year for at least a quarter-century. In this decade, the F series has been pushed from the monthly top spot just eight times: six times by its perennial runner-up, the Chevrolet Silverado pickup; in May 2008 by the Honda Civic small car during a fuel-price frenzy; and in April by the mid-sized Accord. A lousy market, a truck drought and a Honda inventory clearance incentive on Accords all worked in the sedan's favor last month. Even so, the Accord's sales margin over the F series was just 455 units -- 29,212 to 28,757. Overall U.S. sales in April fell 34.3 percent from the year-ago month, to 819,817 units -- the fourth straight month the annual selling rate fell below 10 million cars and trucks. The light-truck share of the U.S. market dropped to 45.3 percent in April from 50.5 percent in January. After American Honda Motor Co. found itself with a 132-day supply of the Accord on Feb. 1, the company offered a 2.9 percent financing incentive on its best-selling vehicle in April. Honda spokesman Chuck Schifsky said the Accord's reputation for reliability and low cost of ownership appeals to buyers in a depressed market. But look beyond a single month, and the F series is still king. This year, Ford has sold 110,336 of the pickups, well ahead of the No. 2 Silverado, at 93,720 units. The Accord is No. 4 overall at 84,491 sales, behind the two pickups and the No. 3 Toyota Camry sedan, at 92,523 sales.